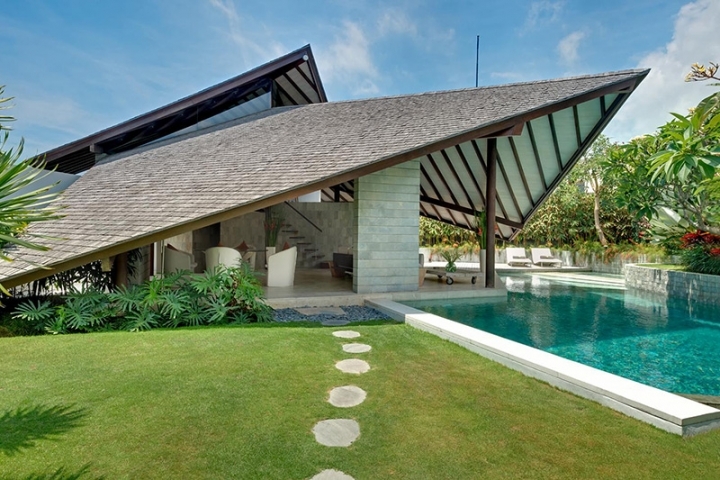 This complex villas are spectacular design-led villa resort in the heart of chic area Seminyak, moments from Bali’s best restaurants, boutiques and sunset beach bars. 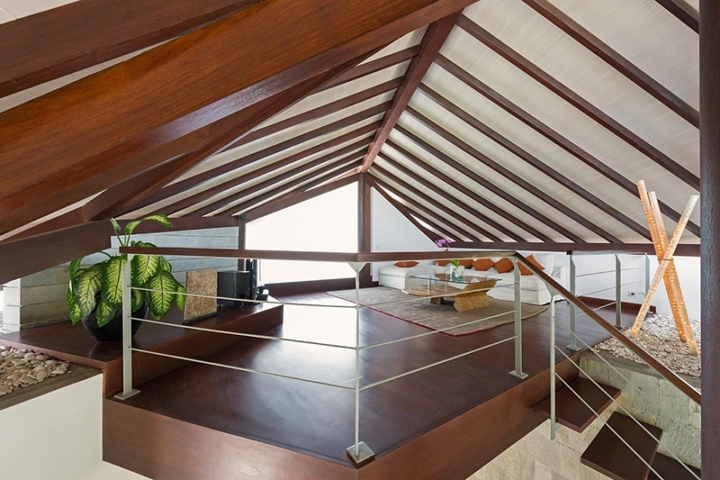 Cutting-edge contemporary architecture and ultra-chic interiors characterize the villas, which offer stunning living spaces by the planes of the architects design sloping roofs. Each individual villa is set within a private landscaped garden with large swimming pool, and from one to four spacious bedroom suites oriented for privacy. With its cool design, strategic location, and five-star service provided by 80 staff, The Villa is designed for those with strong aesthetic feeling looking for original experiences. 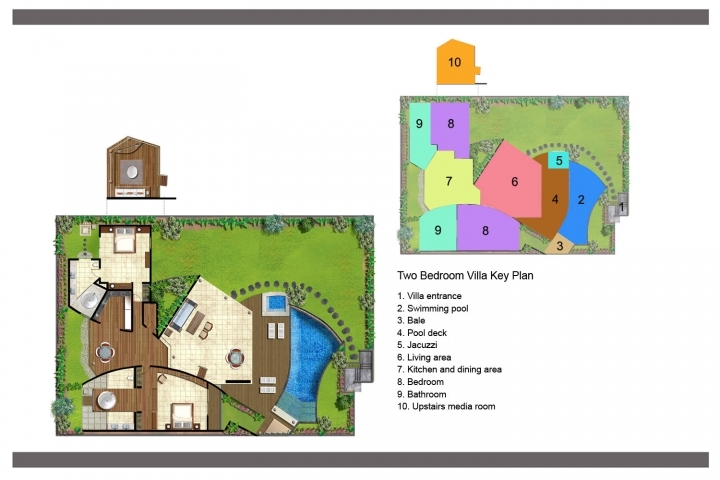 The complex is features four one-bedroom (villa #790), seven spacious two-bedroom (villa #791), eleven three-bedroom (villa #792) and one four-bedroom (villa #1110). 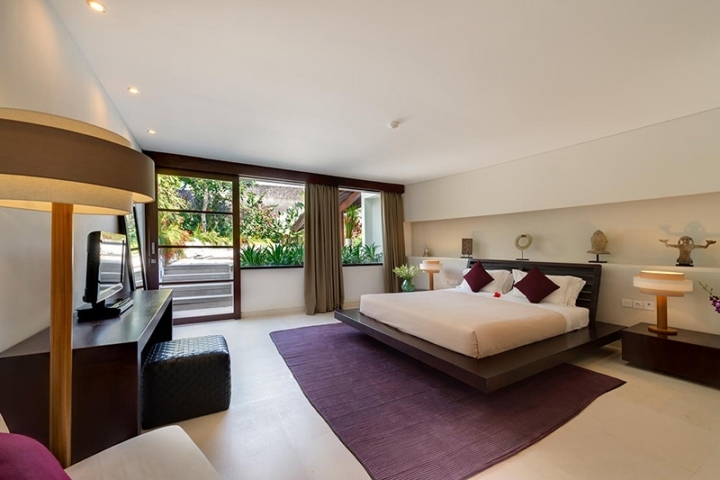 Villa #790: Light-filled king-sized bedroom with its stylish seating area, window onto the courtyard and sliding doors to the pool deck. The garden bathroom either with shower or stone bathub. 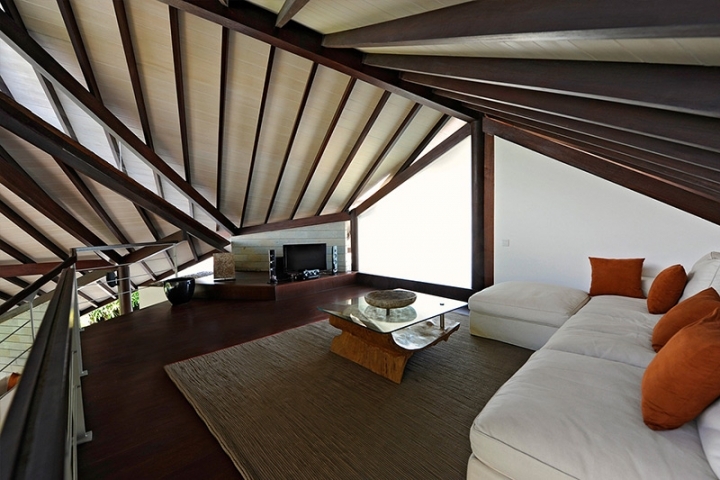 Open living and dining area and to one side of the living area lies the triangular galley kitchen fully equipment. 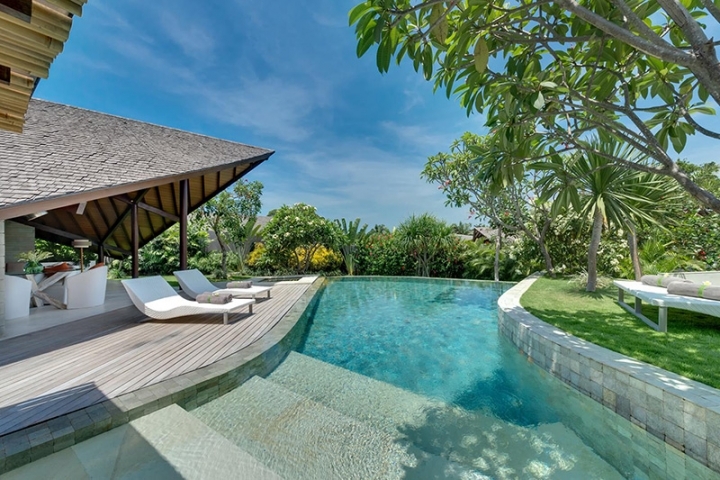 Villa #791: Each villa occupies up to 600sqm of well-screened grounds featuring a wood sun deck with jacuzzi fronting a large curved pool, and – in some villas – a sunken garden house with alfresco seating. 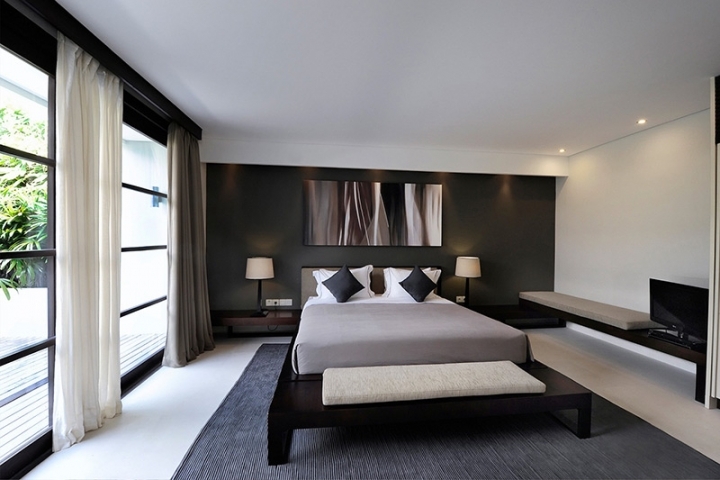 The spacious king-sized master bedroom with sliding doors onto either a small deck or private corner of the garden. 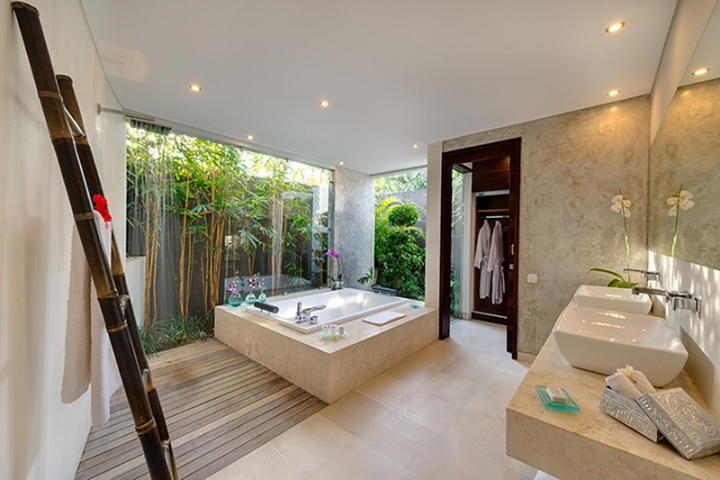 The glamorous bathroom is fitted with a large bathtub, shower and double basins, and features a private garden. The guest bedroom, also king-sized, is secluded, with garden view and an equally gorgeous en suite bathroom. A sofas, chairs and dining tables cluster in the light living area. the pool edge to a the green lawn overlooked by the open-plan and very well-equipped kitchen (including wine fridge and bar counter). Sun loungers stretch out on the deck, while a jacuzzi and shallow steps in the pool offer tempting spots for cooling-off. The garden provides further space for relaxation and socialising. 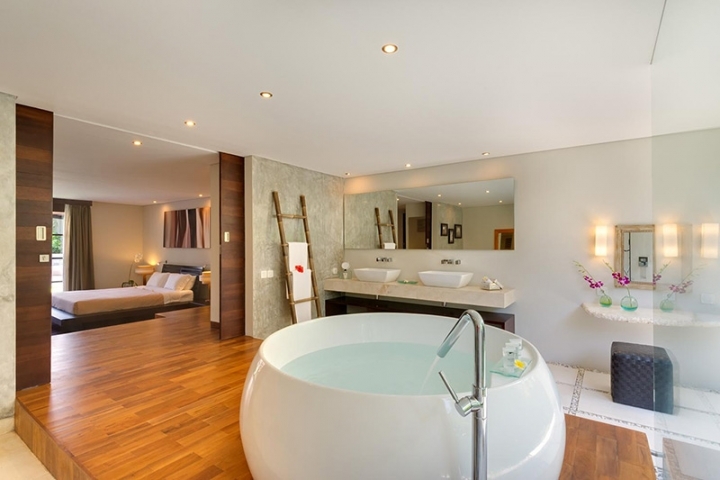 Villa #792: Each villa has the spacious master bedroom enjoys a glamorous bathroom with large bathtub, shower, double basins and a private garden. The two guest bedrooms are secluded, with equally gorgeous indoor/outdoor bathrooms, many also featuring their own private garden areas. The huge open living and dining room fans out from a raised platform alongside the kitchen, widening to the garden and pool area at the front. Another social space is created by the pool deck and garden with sun-loungers. Villa 1110: The two large, air-conditioned, guest bedrooms, each with a unique charm. One is multi-level, with the king-sized bed on a raised wood platform facing the pool, and a dressing area and large garden bathroom (with twin basins, indoor and outdoor showers and a bathtub) on the lower level. The two other bedrooms – one with a king, the other with twin beds – look onto their own corner gardens and also have indoor/outdoor bathrooms with bathtub, shower enclosure, and twin basins. The large living room provides a perfect balance of sociable open-plan entertainment space and quiet. A dining table for eight is separated from the well-equipped kitchen by a bar counter. 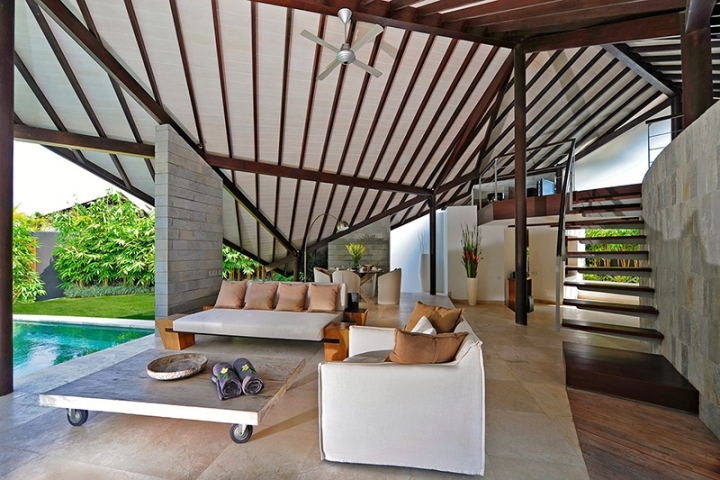 On the lower level, sofas are arranged around a coffee table overlooking the garden and pool. One of the greatest advantages of staying in a villa is the service provided by dedicated staff . Staffs in villas: Manager, reception, chef, butlers housekeeping, gardener, spa therapist, and security. Food and beverage is system menu with price from they own restaurant at the complex. Shoulder season: April 1-19, August 20- September 1, September 28 - October 14. Price per night in Shoulder season: 1 bedrooms is $445, 2 bedrooms is $600, 3 bedrooms is $700, 4 bedroom is $1015. High season: April 19-29, May 29 - June 10, June 29 - August 20, December 20-26. Peak Season: December 26 - January 4.